This mid-18th Century Irish side table displays an arcadian nymph in a shell-scalloped cartouche. The combination of a shallow frieze and exuberantly carved pierced apron, with its punched and diapered trellis ground, are typical Irish features of the 18th Century. 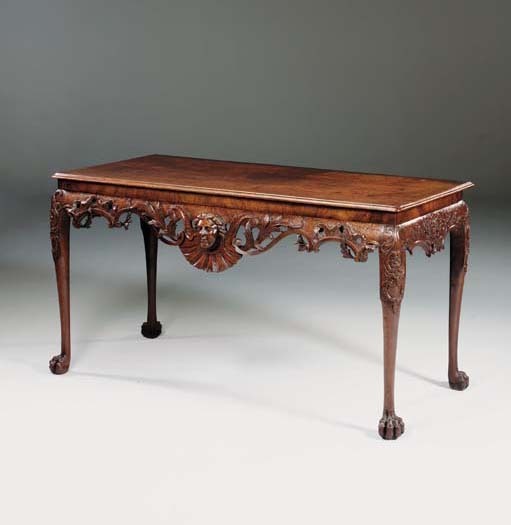 There is a related side table in the Great Hall at Malahide Castle, Dublin (illustrated in G. Kenyon, The Irish Furniture at Malahide Castle, Dublin, 1994, pp. 60-61).